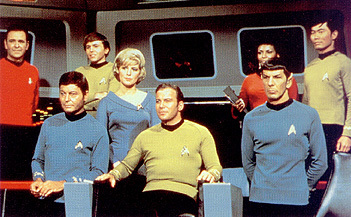 The animated STAR TREK series brought back the voice talents of almost all the original regular cast members with the exception of Chekov. The production studio made an extraordinary effort to capture the likeness of the animated characters' live action counterparts. 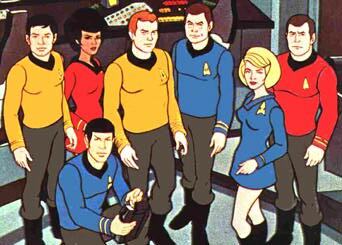 Because the animated art form in almost unlimited, such non-human characters as Lieutenant M'Ress and Lieutenant Arex could be regular crewmembers. Lieutenant Arex especially, a being with three-arms and three legs, could never have been done in a live action series of the 60's or 70's. Below is a cast picture of all the regular crewmembers. Clicking on a particular character will link the user to an individual page devoted to that particular character. (The character of Kirk appeared in 21 of the 22 episodes). (Spock appeared in all 22 episodes). (Dr. McCoy appeared in 20 episodes). Lieutenant Commander Montgomery Scott "Scotty"
(Scotty appeared in 21 episodes). (Sulu appeared in 19 episodes). (Uhura appeared in 15 episodes). (The character of Nurse Chapel appeared in only 9 episodes). (The alien character, Arex, appeared in 15 episodes). (The feline character of M'Ress appeared in only 6 episodes). (The character of Kyle appeared in only 7 episodes). (The character of Gabler appeared in only 3 episodes).